Picture this: you’re on the road with your children on board, it could be a long journey or perhaps even a trip to your local grocery store. It’s a peaceful and harmonious drive and your kiddies are cheerful; a beautiful day with no tantrums or tears in sight. Now let's come back to Earth to acknowledge that more often than not, those car tantrums are our unfortunate reality. A car ride doesn't have to turn out this way though, and the trick to a smooth trip is to keep the little ones as entertained and comfortable as possible. A tale as old as time: when children are restless, calm them down with a little treat or two. Most children are easily persuaded by this method. Packing in a lunchbox filled with treats (they don’t have to unhealthy, but preferably non-perishable) will do the trick. Having little snacks in the car when you're on the go is also a good way to keep your children fed between meals, subsequently cutting down on takeaways too. Since your children will most likely be enjoying a snack or two in the car, make sure you come prepared for a bit of a clean-up. No-one likes a dirty car interior, so make sure there are wet wipes for your kiddies’ hands and for the prospective sticky marks, spillage and stains on the seats or doors. Dry wipes such as tissues or toilet paper are also important for more of a minor clean-up such as crumby hands or boogers. Keep those little hands clean and germ free by having your kids use hand sanitizer in the car. This saves water and you won't have to stop at a restroom to get them cleaned up. Is there anything you feel is an essential to keep in your car when driving with children on board? Let us know by emailing us at chatback@parent24.com and we could publish your comments. Do let us know if you'd like to remain anonymous. A definite way to make your life a whole lot easier is to keep a little dirt packet in your vehicle when travelling with children. As I’m sure you’ve come to know, you’ll need it! To avoid finding old food wrappers or the food itself stuffed between your seats, make sure your children throw their waste into the bin when done with it and empty the bag once they get home. This will teach them to clean up after themselves and to respect your vehicle... hopefully they’ll adopt this habit at home too! Purchasing bottled water is not only expensive, but plastic bottles are extremely wasteful and they'll probably end up lying on your car floor anyway. Make sure to bring bottles of fresh water in your own sippy cups along every time you travel with your children. Those anti-spill bottles with the plastic straws are even better; no soggy little passengers on the backseat. In case any nasty spillage occurs, make sure you have something absorbent such as a towel to wipe it up in a jiffy. Having a towel is also great for keeping your kiddies dry on rainy days when they step in a puddle or something equally as unpleasant occurs. Be prepared for all kinds of weather by keeping an umbrella on board. Rain or shine, it comes in handy. Even on those colder days, UV rays are unavoidable. Make sure your child's skin is always protected by having sunscreen readily available in your car for those long traffic days when the sun comes out to play. Most radio stations don’t cater specifically for the kinds of music children enjoy. A quick and easy way to keep your kids calm would be to play one of their favourite CDs in the car or alternatively, create a kid-friendly playlist on your cellphone if possible. Get ready for some sweet sing-alongs. 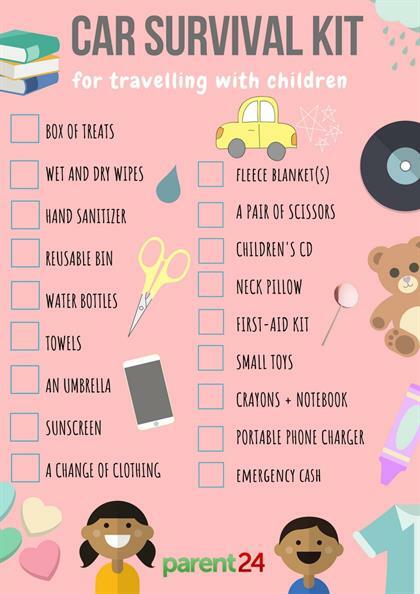 Download our Car Survival Kit printable here. Car closets are a great convenience. When it’s too hot, your child can change into something cooler and when it’s too cold, they can add a layer of clothing. It seems like somewhat of a schlep, but it’s outweighed by the benefit of it all. During those summer days, pack in a swimming costume while you’re at it. It’s rather disappointing to be somewhere with warm weather where kiddies have the opportunity to swim but don’t have their costumes (and inflatable arm bands) with them. Pack them in and get splashing away. Keep a fleece blanket or two in the car for maximum comfort or to keep your kids nice and bundled up when they fall asleep on the backseat (the cutest image by far). Baby blankets can also be used as a sun shade to ensure no UV rays hit your child’s skin while on the road. For a softer snooze and extra neck and back support, keep a neck pillow on board for those longer journeys. It's crucial that parents keep first-aid kits on them at all times. Any little accident could happen and it’s best to always be prepared. In the unfortunate event that your child’s seatbelt or car-seat belt is jammed, keep a scissor in your car to cut it. Children can (shouldn't, but can) become entangled in a seatbelt which is extremely dangerous so make sure you always have something such as a scissor or Swiss Army knife on board. Keep children entertained by having toys in the car. Try to keep the car toys separate from the regular toys around your home, that way your children will be more inclined to play with them when on the trip. To switch up from the toys but still keep children entertained, keep crayons and a notebook on board. Avoid using markers in the car unless you’d like to end the trip off with an unsolicited artwork on your rear windows. Making sure you’re able to contact someone and that you are contactable is essential, especially in an emergency situation. Cellphone batteries these days tend to not last very long, so keeping a power bank or portable charger will be a great benefit. Be secure in knowing that you’ll always have extra money hidden away in your car just in case you’re on the road and forget your wallet at home or need some extra coins in an emergency situation. A happy child means happy parents, so here's to more joyful journeys ahead!